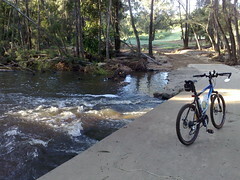 I enjoyed cycling over “Bunya Crossing” this morning, and riding along the banks of the South Pine River. 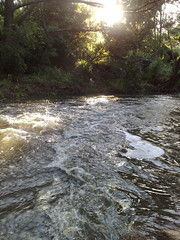 Recent rain has given the river a generous flow, and I passed several spots which looked like they would be great for a swim. 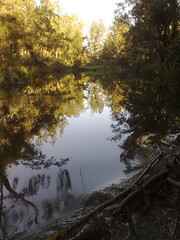 “Bunya Crossing” crosses the South Pine River between Eaton’s Hill and Albany Creek. This area was originally settled by James Cash around 1851. He gained freehold title in 1858, becoming the first freehold land owner in the district. 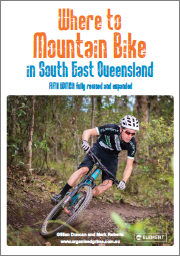 You can hike or cycle this area starting at Sargeant Reserve on Bunya Crossing Road, cross the river, and follow it mostly by pathways all the way down to the main bridge on South Pine Road at Cash’s Crossing. As a much younger lad, (1950’s) I often cycled, with friends, from the family home at Alderley to Bunya Crossing for a swim or to fish. Later, when we reached driving age, (early 1960’s), we would drive there for the same reasons. It was a dirt track in those days from Old Northern Road all the way to Bunya Crossing. Most of Old Northern Road was also dirt, but at least a “road” as oppossed to a “track”. You could drive (or ride), across the creek at Bunya Crossing and carry on to Petrie through a farm. You also mention Cash’s Crossing which was another, & more easily accessed, swimming & picnic spot, very popular on weekends in those days. There was a kiosk there then for food & drinks. Most of these swimming areas & the fishing were ruined when they built the dam upstream. 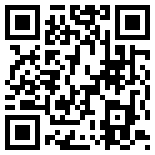 It was interesting to see your pics & read about your ride. Thanks for your fascinating recollections. Do you have any photos of the area from the 60’s? No, sorry mate, none of us could afford the luxury of a camera in those days. I note that in my post I state that you could ride or drive ‘across’ the creek at Bunya crossing, I should have said ‘through’ the creek, there was no bridge, the water was only about 6-8 inches deep with a rocky bottom and it was quite safe to drive through it in my 1947 Morris Series E Tourer, the first car I owned. Cash’s Crossing did have a bridge.